GCT (Global Connector Technology, Limited) is a leading supplier of standard and custom interconnect products. 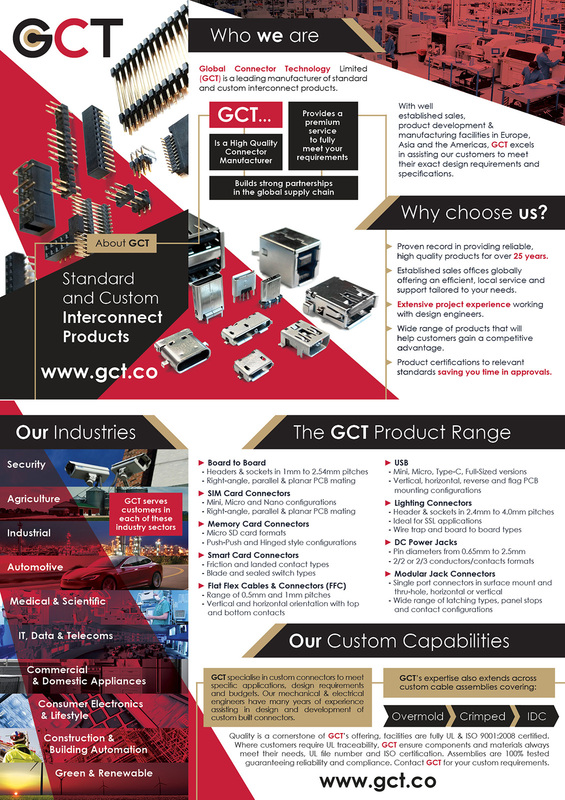 GCT is instrumental in the supply of reliable high-quality connectors for applications in Mobile & Wireless Communication, Computer & Peripherals, Digital Entertainment, Networking, Industrial, Automation, Security, Medical, Instrumentation and other Consumer Electronics. GCT leverages extensive worldwide resources to meet customer needs at local, regional and global levels. GCT has well-established sales, product development and manufacturing facilities in Europe, Asia and the Americas. We support you wherever you design - wherever you manufacture. GCT offers reliable high-quality products, a competitive advantage and partnership to our valued customers. Customer - To build long term relationships through great value products and excellent service, from design thru delivery and beyond. Service - We strive to continually provide you with the highest level of service. Quality – To provide the highest quality products possible assured by rigorous processes and controls. People - We hire good people who make a difference. We train and encourage our people to delight our customers. Profitability - Our investment in people and technology coupled with continuous improvement and flexibility have ensured long term profitability and growth. With established Sales Offices in Europe, Americas and Asia, GCT offers speedy local sales service and technical support tailored to our valued customers. And, by leveraging worldwide manufacturing resources, GCT offers competitive advantages in recommending good value compatible interconnect options that will save customers money, thereby considerably lowering the BOM cost and increasing customer competitiveness. For more details about how GCT can assist you to select the best interconnects for your design needs and reduce BOM cost, please contact GCT. Quality and reliability are of utmost importance when considering an interconnect product. GCT is committed to excellence in product quality and reliability. This is achieved with stringent quality control, quality assurance and product testing procedures. GCT believes in investing in training our engineers, and in continually improving our business and our Quality Management System. All GCT products are UL, RoHS and REACH compliant. GCT's compliance with the EICC Code of Conduct ensures that GCT is at all times compliant with the new UK Modern Slavery Act. Furthermore, GCT maintains an ISO 9001: 2015 compliant quality management system. View Certificate.